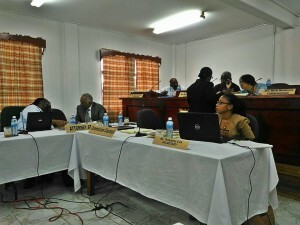 President of the Guyana Bar Association (GBA) Chris Ram on Thursday demanded that inmates appearing at the Camp Street Prison Commission of Inquiry (CoI) be given legal representation when giving their testimonies at the Commission. This is despite Ram offering the services of members of the Bar association in a pro-bono manner for persons appearing before the Commission. “They are human beings and are not denuded of their fundamental rights… I am therefore appealing that we ensure that everyone at least knows his or her rights and let them make that decision. Until you tell them what their rights are,” Ram sternly stated. The GBA President asked that the Commission make a recommendation to the Attorney General and Public Security Minister for the prisoners to be granted legal representation via the state. “These persons died or were injured while in the custody of the state. The State has an obligation to every one of these persons. The State has resources and I believe the state should be invited to provide counsel for every person who needs representation or at least to provide the resources,” Ram stated firmly. Prison and Police Attorney Selwyn Pieters agreed with the position adopted by Ram but was quick to state he would support such a motion if it were to be put in writing and served on the concerned parties properly. “I agree with him that counsel should be provided for everyone that comes here and the State should pay for that counsel,” said Pieters. Commission Counsel Excellence Dazzle made the point that the Bar Association did mention that it would like to have pro bono work hence it should now step up to the plate. The decision was then taken to proceed with the hearing and deny the initial application made by Ram.